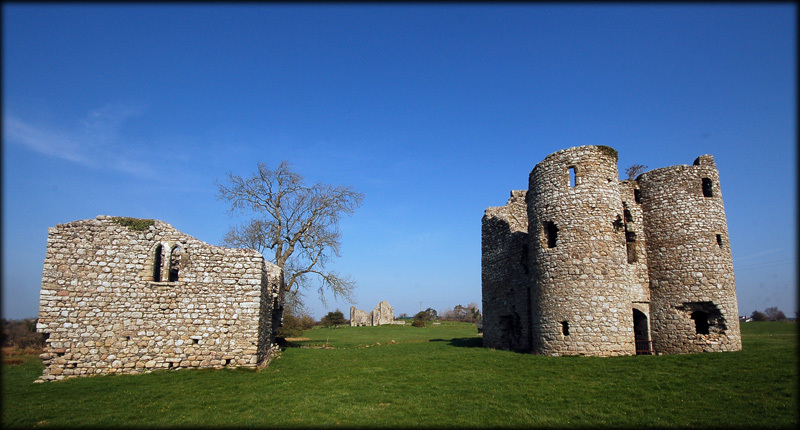 This twin-towered gatehouse and bits of two ruined castle towers and wall stand proudly in a cleared farm field, easily visible but well back from the road. We couldn't wait to get up close to this grand structure but was stopped by two locked cattle gates and no clear right of way ! When knocks on the door of the nearest house did not solicit an answer, Jim got back in the car to find the owner to seek permission to enter. Fortunately permission was granted so we scrambled over the gates and thoroughly enjoyed the walk up to the ruins. 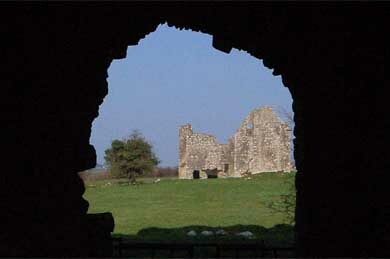 The gatehouse is considered one of the finest examples of its type in Ireland. It is believed it sat in the middle of one wall of a rectangular enclosed courtyard. 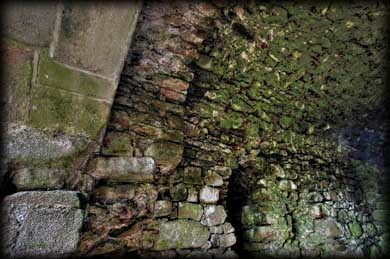 Other than this grand gatehouse only the remains of two small rectangular corner towers can be found today - one shown to the left of the gatehouse in the photo above, and one at the back corner to the right of the gatehouse.We were delighted by the stonework of the vaulted ceiling of the gatehouse passageway. 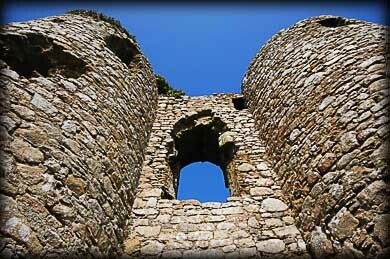 The gatehouse's cylindrical towers protected the entrance to the courtyard and provided housing for the gatekeeper. 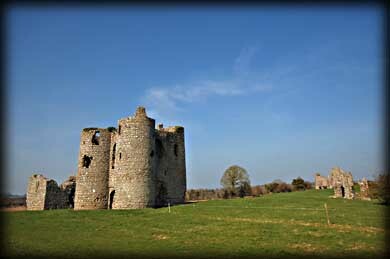 Although the early history of this castle has been lost, its architecture suggests it was built by an Anglo-Norman lord c.1300 when much of County Carlow was passing into the hands of the native Irish Kavanagh family. There is also evidence that a moat protected this castle, but has since been refilled. 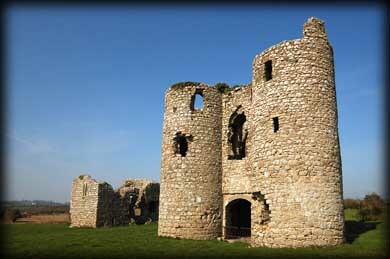 Just beyond the grounds of the castle stands a 17th century ruined house. We were enchanted by this lovely ruin and thrilled to have visited on such a beautiful day. Situated: From Bagnelstown head east on the R724. After about 3 kilometres keep right at the fork leaving the R724. Then 2 kilometres down here turn right. Ballyloughan is in a field to your right. This route is well sign-posted. Discovery Map 61: S 864 606. Last visit March 2011.